Carpal tunnel syndrome is the name given to a group of symptoms involving the thumb, index and middle fingers of the hand. The symptoms are caused by a nerve in the wrist being squeezed. The nerve in question is called the median nerve and it serves the thumb, index and middle fingers of each hand. The nerve passes through the middle of a 'band' of tissue, rather like an elastic band that runs round the wrist. For a variety of reasons, the median nerve can be put under pressure where it passes through this band. It is this squeezing of the nerve that results in the numbness and tingling in the hands and arms that people feel. The band of tissue the median nerve passes through is known as the 'carpal tunnel' (taken from 'karpos', the Greek word for 'wrist'). And because the symptoms are due to pressure on the median nerve in the carpal tunnel, the condition is known as carpal tunnel syndrome. The majority of patients with carpal tunnel syndrome have no obvious cause for their problems. But it is obvious that any condition that puts pressure on the median nerve may cause it, or make the symptoms worse. Common conditions associated with carpal tunnel syndrome include: pregnancy, rheumatoid arthritis, obesity, an underactive thyroid gland (known as myxoedema), diabetes or injury. Also repetitive movements, such as in typing or computer work, can cause tendons at the wrist to become inflamed. 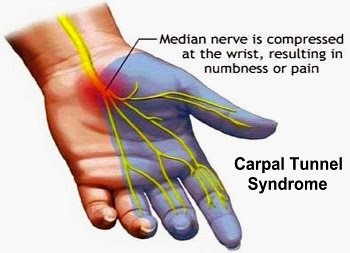 This may result in the median nerve being squeezed, resulting in carpal tunnel syndrome-type symptoms. At first, there is numbness and tingling of the hand. These feelings are normally confined to a very specific area - the thumb, index, middle and part of the fourth fingers. The symptoms are usually worse at night, often waking people from their sleep. They will often shake their hands vigorously to try to ease their discomfort. It is not clear why symptoms should be worse at night, but may could be due to the position of the wrist when the person is asleep. Some people with carpal tunnel syndrome resort to sleeping with their hand hanging out of the bed to try to stop the symptoms occurring. If carpal tunnel syndrome progresses, the affected hand may become progressively weaker, with objects being dropped as a result. The small muscles in the hand can waste, and there may be sharp, stabbing pains travelling up the arm at any time. The diagnosis is usually made from the history and pattern of hand numbness and other symptoms. When there is doubt, a nerve conduction study may be carried out to confirm the diagnosis. In this study, the doctor measures how quickly nerve impulses pass down the median nerve - it is a painless test. When the person has carpal tunnel syndrome, these impulses slow down as they pass through the carpal tunnel, proving the diagnosis. If other diseases are being considered, blood tests are often performed - including a full blood count, thyroid hormone tests and blood sugar levels. Wrist X-rays are sometimes useful to prove or disprove the presence of wrist arthritis. Treatment of carpal tunnel syndrome depends on how severe the symptoms are. If symptoms are mild or intermittent, there may be no need for any treatment at all. If this is the case, the doctor will 'wait and watch' to ensure that, if the symptoms become worse, treatment can be started when needed. The simplest treatment is conservative - placing ice packs on the wrist, resting the hands and wrists regularly and using wrist splints to support the wrist. If repetitive movements appear to be the cause of the symptoms, using a computer wrist rest and repositioning the table and chair so that the computer or typewriter is at the correct height is advised. Any underlying illness (for example obesity or diabetes) will be treated appropriately by the doctor and carpal tunnel syndrome symptoms will settle as a result in such cases. If pregnancy is the cause, once the baby is delivered symptoms usually settle. Tablet treatments may be needed and the usual ones taken are non-steroidal anti-inflammatory tablets - known as NSAIDs. These tablets will reduce the inflammation at the wrist and so ease the symptoms. These occasionally can have the side-effect of indigestion and, rarely, stomach ulcers, so you should always tell your doctor of any stomach problems during a consultation. To minimise these problems, NSAID tablets should be taken with food. However, should you experience any stomach problems, you report them to your GP. Injections into the wrist may relieve the problem. Such injections are made directly into the wrist joint after a local anaesthetic has been given. If conservative measures listed above do not ease the symptoms, or if numbness and weakness progresses, then surgery may be considered. This is a simple procedure that involves releasing the pressure from the band of wrist tissue (the carpal tunnel) by making a small incision into it. 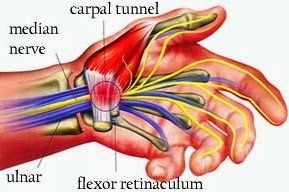 This operation is called carpal tunnel release and is rather like cutting an elastic band. This surgery is usually followed by the person being asked to carry out specific exercises to strengthen their wrist and hand muscles again. The majority of people with carpal tunnel syndrome find that their symptoms improve with either simple conservative measures or tablet treatment. It is only when the pressure on the median nerve is so acute that there is the risk of permanent damage that surgery will be carried out. If your job appears to be aggravating carpal tunnel syndrome, it is important to reorganise your working conditions to minimise the pressure on your median nerve. Raising or lowering desks and chairs so that the keyboard is at a comfortable height will reduce wrist strain, and some people find wrist supports helpful. Vitamin B6 may be of some use in reducing symptoms, although it is unclear why this should be so. Conditions such as obesity and diabetes should be tightly controlled (usually with your doctor's help) wherever possible. 2. Do you ever work at a keyboard for long periods? 3. Do your symptoms wake you at night? 4. Do you shake your wrists to try to relieve your symptoms? 5. Is your wrist/hand numbness and weakness getting worse? 1. Will I need to change my job? 2. Do I have any evidence of other illnesses that may cause these symptoms? 3. Where can I get a wrist support? 4. Are there any reasons why I cannot take anti-inflammatory drugs? 5. Do I need to see a specialist?